Competing in a triathlon with type 1 diabetes is arguably the biggest challenge that sport can pose to your blood sugar levels. Triathlons take place over a long duration and require severe intensity and aerobic endurance, which will necessitate vigilant monitoring of your diabetes. owever, your diabetes is no reason for you to not be able to compete in a triathlon. A triple threat of swimming, cycling and running may sound hard to manage, but it can be done, mostly through a period of trial and error to find a routine that works for you. Wearing a continuous glucose monitor (CGM) can be hugely beneficial when competing, especially as some will function in water. This can allow you to check your blood sugar at any time of the race. Gary Blakie was diagnosed with type 1 diabetes when he was 12. He went on to represent the United Kingdom in the World Triathlon Age Group Championships. At the age of 21, Blakie was one of the youngest competitors in the 2005 World Triathlon Championships, which involved a 1.5k swim, 40k bike ride and 10k run all in one day. Please note, the information below on managing diabetes when training or taking part in a triathlon is written for people with insulin-dependent diabetes. Training for a triathlon can incorporate over three miles of swimming, 150 miles of cycling and 25 miles of running per week for some. For others, this level of intensity may be different. Each exercise can have a different effect on blood sugar levels and require different approaches, especially if you train in all sports on the same day. Swimming can drastically reduce your blood glucose levels, so it advised to start a session with a blood sugar of over 12 mmol/l. When training, especially as a beginner, you should stop swimming every 30 minutes and test your blood sugar. Eating some carbohydrate or consuming sugar during and after the swim will prevent your blood sugar falling. Running can have different effects on people, but testing your blood sugar before and after a session will be necessary. A reduction in your insulin may not be, providing you do not run when insulin is working at its optimum performance time - which is normally two-three hours after absorption for quick acting insulin. Cycling, meanwhile, can require breaks to adjust blood sugar levels. This is especially important if you are cycling as your third consecutive sport of the day, in which case fatigue will impact your energy levels. Stopping during your triathlon and testing your blood sugar may be problematic, if not wearing a CGM, especially when competing with others as stop times can hinder your time. However, if not wearing a CGM, there are moments where checking your blood sugar will be essential. Regimes obviously differ depending on race lengths, but starting with a small breakfast is generally advised, which will not require any quick acting insulin. Eating a little and often is best, as you do not want to be exercising on a full stomach and this can help keep your glucose levels up throughout the race. However, if your blood sugar goes too high, you will feel tired and thirsty, leading to your heart rate increasing and your energy decreasing. Moderation is therefore important. For swimming, starting with blood sugars of over 14 mmol/l will allow your blood sugar to drop at a manageable rate. You will need to have this slightly over the previous recommendation of 12 mmol/l to account for the extra exercise throughout the day. Tucking a small sachet of glucose, or other form of sugar in your wetsuit can account for any emergencies. If you feel low, check your levels if possible, but otherwise go with your gut feeling and consume the sugar. Many triathletes report getting out of the water following their swim and finding the transition to cycling physiologically hard. At this time you should assess your levels and consume some sugar, such as dextrose tablets. Using your CGM can allow you to keep an eye on your levels in real time and consume more sugar as needed, allowing you to focus solely on the ride. Otherwise, taking the equivalent of a dextrose tablet every 10 minutes, placed conveniently somewhere on your bike, such as taped to your handlebars, can keep your levels up. Some triathletes with diabetes have also been known to tape their blood glucose testing kits to their bikes to allow for quicker testing, which may be very useful for long distance events where stopping could be a hindrance. However, this is quite a risky method of blood testing and safety should be your optimum priority if you choose to adapt this approach. Sugar doses may need to be increased during this stage, with your energy levels dropping in likelihood and your blood sugar potentially falling as well. Eating additional carbohydrates of around two or more glucose tablets every 30 minutes and stopping to test your levels, if you feel low, will be necessary. Following the race, you will need to check your levels every one-two hours for the rest of the day, with hypos likely to arise given the increased activity that your body has exerted. Eating normally will help you refuel with your afternoon or evening meal, and here you could consider a reduced injection of insulin with your food. Keeping your blood sugar slightly higher than normal throughout the evening and during the night can stop rapid drops from occurring. A triathlon can take you over a long distance, and medical identification must be worn should an emergency happen and people are trying to help you. You should remember to take special care of your feet when exercising. Your choice of footwear should be comfortable throughout. Competing in a triathlon will require consistent foot care as even a minor injury could hamper efforts. Can I wear my insulin pump whilst taking part in a triathlon? Swimming with an insulin pump can be done with certain pumps, but most will have to be disconnected before you begin swimming. For cycling, falling down is a risk for your insulin pump, but if positioned in a place of the body, such as the arm, where the tubing won’t get snagged, then wearing your pump should otherwise be fine. There should not be any issues wearing your insulin pump while running. What do other people say about triathlon training? 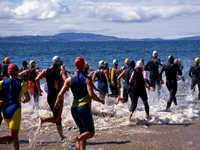 A number of Diabetes Forum members have posed questions in regards to triathlon training. christiearras wrote: “I have been recently diagnosed with type 2 and am preparing for a mini triathlon in September. I've asked people what they eat (squeeze goop, chocolate, etc.) and wonder what would be recommended for a diabetic”.